With views of the River Lagan, our two level fully equipped fitness suite provides members with a full range of top of the range equipment to enjoy keeping fit. Our personal trainers are on hand to provide one-to-one sessions or simply encouragement and advice. We run a jam packed timetable of fitness classes, open to members and non-members which include spin, pilates, kettlebells, body pump and more. In the good weather, you can enjoy our outdoor gym, overlooking the Lagan. Relax and unwind post workout in our sauna. Exercising with others is a great way to keep on top of your fitness goals and to stay motivated while having fun and getting fit. We’ve got an extensive range of exciting exercise classes available to members and non-members. From holistic classes such as yoga and Pilates to high intensity classes such as spin, circuits and Boat Club pump. Whatever type of exercise you enjoy we have a workout class just for you. Our dedicated team of experienced personal trainers are on hand in the fitness centre to motivate and guide you through your use of equipment and workouts. Whether you would like some friendly advice or a series of personal training sessions they can help. 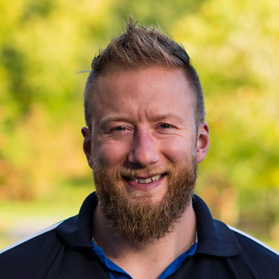 Kris is a level 3 personal trainer with 13 years’ experience in the industry. He specialises in powerlifting, ultra-fit and 1 on 1 sessions. Kris is the World, European, Irish and Northern Irish powerlifting champion and world record holder.